Great list. I’ve been pretty absent in the cinema this year, so I feel like a hermit looking at the ones you’ve seen. Loved Ex Machina and Fury Road. Really excited to see Anomalisa and The Revenant. Your description of Bridge of Spies makes me a little more interested to see it. I knew with Spielberg directing a Coen Brothers script it couldn’t be terrible, but the not what you’d expect aspect makes me excited to check it out. And I feel ashamed for not having seen What We Do In The Shadows. Damn ashamed. I loved It Follows, though it seems that it wasn’t everyone’s cup of tea. If you like Flight of the Conchords (or Eagle vs. Shark), you will love What We Do in the Shadows, and Bridge of Spies is definitely worth watching. I haven’t seen It Follows but it looks truly creepy! I do love Flight, Eagle vs Shark, and pretty much anything Jermaine does. I will watch it this weekend. It Follows is creepy and just really well made. Oh, I really liked The Guest, too. Not sure if that was 2015 or 2014. You did these in order??? Good for you, babe! I felt I had to organize it somehow! I’m still second guessing the order though. Yeah Star Wars was a surprising exception. Most of your releases are delayed a while and that makes no sense. Hopefully that improves as global box office numbers become more prominent. Great list. Just saw Ex Machina last week and was surprised how much I liked it. Looking forward to Anomolasia. I would put in a pitch for The Hateful Eight. Just saw it in 70mm on the Road Show this week, with intermission, programs and all. It was a great movie-going experience. Classic Tarantino. WHAT… A. LIST! You know it’s been a good year when The Martian only makes it to number 9 and Mad Max isn’t even number one. Can’t wait for The Revenant and Anomalisa. Yes I think you will enjoy both immensely. And I’m looking forward to seeing/hearing about your favourites! Good choices. I’ve seen many of them. But I still haven’t seen Creed. I’m worried it’ll be gone before I do. Guess it’ll be a Redbox rental down the road. I wasn’t expecting much from Creed but it really brings a breath of fresh air to the franchise. Probably the best soft franchise reboot I’ve seen. By the way, your book is amazing, I couldn’t put it down! Is there a good spot to post a review? Aw, thank you! So nice to hear. An Amazon review is always a treat. Thank you so much for wanting to leave one. I notice you had a few spy films on your list. Did you notice? Funny enough I had What we Do in the Shadows in the number 10 spot on my 2014 year-end list. Such a fun flick. Solid list of films, we share a few of the same choices. I still need to see Spy, Bridge of Spies and The Revenant (really looking forward to this one, it opens in Toronto next week). I am so happy to see What We Do in the Shadows on your list! It didn’t make it to our collective top ten list because I was the only one who saw the movie in our group. But we might do a notable movies post and I’ll probably sneak it in there because it such a fun and hilarious movie. And the special effects were pretty amazing too which proves that you don’t need expensive, fancy CGI stuff to make it work. And Fury Road and The Revenant were absolutely relentless. I loved both of em. 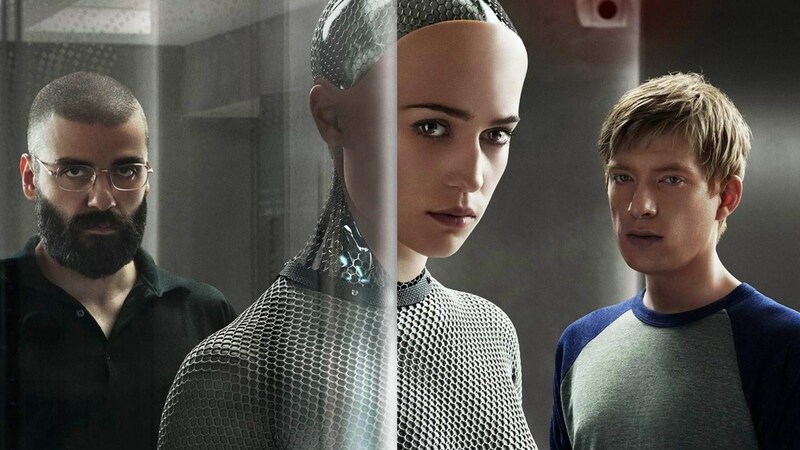 And Ex Machina is amazing as well. The ending just floored me. And it has one of my favorite movie scenes this 2015: Oscar Isaac doing some disco dancing. Haha. I am excited to see Anomalisa. It sounds crazy weird, in a good way. Good place for me to get some recommended films to watch – thanks for the tips. A great list there. Unfortunately I haven’t been to the cinema much at all this year (nor have I sat down to watch much at home! ), so haven’t seen any of these! The Martian, The Revenant and Mad Max were already high on the list, but there’s a few others here I need to add! All the best to you guys for the year ahead! What We Do in the Shadows is a fun comedy, so well written. More people need to find that film. I’m anxious to see your #1. Kaufman’s Synecdoche New York was so unique. Great list! Some on here I’ve never heard of but will now look out for! 🙂 happy new year! That’s a good list of stuff I’ve heard of and stuff I haven’t. Thanks! Great list. Man, I have to see Anomalisa. It’s number 1 on a few top 10s now. I really loved Ex Machina and Creed, from your list. Love the list-loved Spy! Very funny:) The Kingsmen was also quite good and funny even if gory. Have to see the others though-Happy New year! Super list Sean. I’m a fellow Bridge of Spies lover, definitely one of my favourites of 2015 — I doubt Spielberg and Hanks (and the Coens) are able to make bad movie together. I would add Inside Out. A solid pick and one that was definitely in contention for me, but didn’t quite make the cut. I just think the whole concept/premise of the movie was brilliant.